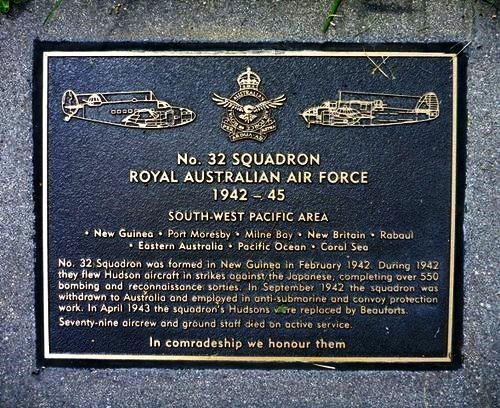 Plaque commemorates the personnel who served in No.32 Squadron Royal Australian Air Force during World War Two. No. 32 Squadron was formed in New Guinea in February 1942. During 1942 they flew Hudson aircraft in strikes against the Japanese, completing over 550 bombing and reconnaissance sorties. In September 1942 the squadron was withdrawn to Australia and employed in anti-submarine and convoy protection. Seventy-nine aircrew and ground staff died on active service.